Arguably, LG has become the industry leader in 4K TV’s and over the years they have exceeded our expectations with their newest lineup of OLED Smart TV’s. When talking about the best 4K TV manufacturers out there, there are only a few names that come to mind with LG being up there with the very best. 2017 is already showing a lot of promise for the South Korean tech giant as they look to pave the way in 4K technology. When looking for the best LG Ultra HD 4K OLED Smart TV out there, there are many things to consider before shelling out thousands of dollars. Some would argue that LG is the only manufacturer worth looking at if you’re in the market for 4K TV which gives you amazing specs, ridiculous clarity, vibrant colors, and the ability to have one central media hub. The following review details the Top 5 Ultra HD 4K OLED LG Smart TV’s in 2018 and all the reasons why you’ve got to get one. This amazing 55-inch LG OLED TV literally brings you into the visuals and captivates everything you see with the best colors, perfect blacks, and ultra-responsive response rates. The 4K visuals are by far the best we’ve ever seen and the Smart technology is truly an added bonus. If there’s on TV to get this year, the LG 55” OLED Smart TV had better be it. The innovations of LG with TV technology introduce High Dynamic Range 4K resolution and Dolby Vision. The visuals speak for itself, but what this flat screen also brings with it is premium sound thanks to the Harman Kardon Sound. Operating on the newest webOS 3.0 operating system, you not only get speed, but the award winning Smart platform technology. If you’re looking for size and technology, then check out this 65” curved OLED TV from LG. This is the premium TV you’ve been looking if you’re looking to create a media paradise as this 65-inch Smart TV features all the bells and whistles and holds nothing back. The 65” curved viewing angle makes it possible to get the same great visuals from anywhere in the room with an HDR enhanced display. This curved 65” LG OLED TV offers the best in visuals including perfect black, cinematic color, and LG’s own enhanced High Dynamic Range. 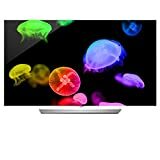 LG’s HDR is better than others with the addition of Dolby Digital which displays more than a billion colors on an ultra-sharp 65-inch display. With an upgraded WebOS 3.0 interface, Harman Kardon Sound, and a super slim and stylish design, you can rest assure this beauty will become the focal point in your house for years to come. Despite the fact this is a 2015 model, it’s not only one of the best OLED TV’s on the market, but one of the best, period. This 65” OLED Smart TV features amazing clarity in true 4K resolution of 3840 x 2160. LG’s newest TV technology is seen in this OLED model which gives you four times the resolution of true HD and more than 8.3 million pixels. The intuitive webOS 2.0 will become your central hub for entertainment which is simple to use, navigate, and connect all your favorites. The intuitive platform will become your new best friend and ultimately a much better media experience. This 65-inch LG OLED TV won’t be for everyone as it comes in just below $4000, but if you can afford the newest model it will prove to be well worth it. Coming standard with all the latest in LG technology including Dolby Digital, enhanced High Dynamic Range, 4 HDMI inputs, Cinematic Color, Perfect Black, Smart Technology on the newest webOS 3.0, Harman Kardon Sound, and much more. The elegant look of this 65-inch OLED flat screen will soon become the focal point in your living room, but this TV goes well beyond the visuals. Serving up wide viewing angles gives everyone on the couch the same amazing look. The newest in high dynamic range technology has been expanded by LG to give full support for Dolby Vision content. This is what was intended by movie makers which gives you the richest darks, irreplaceable contrast, and amazing brights. If you’re looking to spice up your living room without breaking the bank, this LG OLED Smart TV is a great option. Coming in hundreds less than others in this review while giving you true 1080p HD resolution and not 4K. This 2015 model is a curved variant which gives you the same amazing look with no glare even if viewing from the outside of the room. This curved 55-inch OLED Smart TV offers an intuitive interface on the webOS 2.0 platform which has been proven to be much easier than others. With a Magic Remote, 3HDMI inputs, and Cinema 3D technology, you can create the media room of your dreams for not much over $1000. Feel free to drop us a comment below if there’s anything we may have left out on the Top 5 Ultra HD 4K OLED LG Smart TV’s in 2018, and be sure to share your new purchase with the rest of the community.